It's the ZX Spectrum's time to shine as today a new game was released for the 80's system and this one is a face punching platformer developed by Retrobytes Productions for the ZX-DEV 2015 comp. 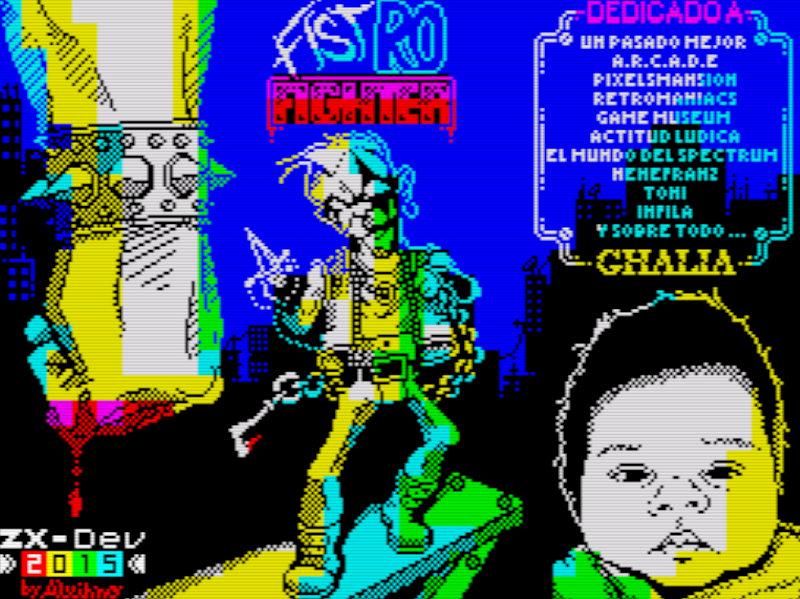 Titled as ' Fist-Ro Fighter ', you play as Salmeula San, working in the Police Department in Santa Coloma that has learnt the ways of an ancient fighting technique called RO. The problem is, you're not the only one with this technique as a rather jealous colleague by the name of Gazpanchete, has found your secret and will use it to cause you no end of grief. Through many different levels, you must fight your way through multiple enemy types to finally reach Gazpanchete´s lair so you can hit him with your fist full of RO power. But be warned this wont be easy, as if you get hit, your face goes from the ultimate fury to an ever more sad state until your spirit is drained and you become a laughing skull. But there is an upside to this punching frenzy of a game, if you can keep hitting without being touched, your RO power will raise connecting with the RO! Ancestors, who will give you more power and stamina from then on. Failing that, a good feast found throughout the level will improve your state as well! In my opinion this is a very nice game to look at, with great attention to deal from the platform designs, to the objects found throughout. The game is also unique as it is not often you'll find a game like this on the ZX Spectrum, where punching and being hit back also affects the overall state of a character which is shown by facial impressions. What severely lets the game down however is the control detection, as at times you cant switch from one direction to another quick enough to both punch and move at the same time. Furthermore because of the colour clash and very similar character designs in the early stages, it can be a little confusing as to which character you are playing. But again opinions differ as you may find this game the ultimate of ZX Spectrum releases, while others may not. But as it's free to download, I'll let make your own mind up!